How do you explain what you do to people who aren’t necessarily in-the-know with social media? It’s me documenting my food journey around Cincinnati and during my travels, just because I enjoy checking out the new, up-and-coming bars and restaurants in Cincinnati, and because I like trying new foods, as well. Obviously people see me as a quote/unquote “foodie influencer,” but I personally don’t really like the word “influencer.” It’s just my perspective and how I view stuff, and I don’t want it to necessarily impact what other people think of things. How did you get into this? Was it something you’ve always been interested in? No, there were really a few factors. I moved to Cincinnati for work after I graduated from Miami University in Oxford. I happened to get a job here and it was a new city for me to explore, and I did so by checking out the bars and restaurants through happy hours. A drink or a dish would be really cool or pretty, and I would want to take a photo of it. It came down to [the fact that] I would take photos or Snapchats of all of my meals before eating them and it got to a point where my friends on social media were probably all like, oh my god, she’s sending me pictures of food again! I had played with the idea of starting a food Instagram a few months before I actually did it, but ultimately I finally created one with the push of my friends. Were you surprised at how quickly you gained a following? I’ll be honest, my background is not in marketing or business, so I was just kind of doing this blindly because I thought it could be something fun to do just as a hobby. I want my followers to be interested in my content organically, so I’m not going to pay for some robot to get me followers. 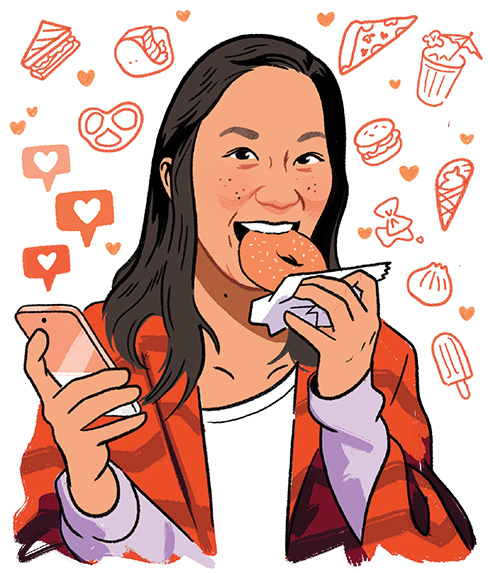 I initially started out by tagging the restaurants in my photos and following them on my Instagram, of course, just outlining my experience there and what I thought of the food. When you started you were finding these places on your own, but do they approach you now? Yeah, some restaurants do approach me whenever they have a new menu being debuted or maybe they’re just trying to get more awareness of their restaurant. How do you decide what you’ll actually post about? Having either been to the restaurant previously or if it’s a new place I haven’t been before, I’ll be like, yeah, I’ll come check it out. It’s not Cincinnati-related, but there have been some companies or brands that have reached out and they’re like, hey, we’d like to send you some free products, but sometimes I say no—or at least I caution them that I’ll try it but can’t guarantee a post or anything. Do you only run what you actually like? What is your process for creating the “perfect post,” and how has that changed since you started? With taking pictures, there are a lot of different angles you can [shoot] from, and also it depends on the lighting, so I mean, I do edit my photos a bit—only using Instagram, not with any other photo-editing app or Photoshop or anything. But I do try to be quick with my photo taking because I know others want to eat their food, instead of letting the camera eat first. So there’s not really a huge process to it. My request is just give me a minute or two to take some pictures before you guys start eating. Your friends come along to help? Yeah, and sometimes—I like looking at the menu before I go somewhere, just so I know what to order, but if one of my friends goes, oh yeah, I was eyeing that dish, too, I’ll be like, OK, you can order this dish and I’ll order something else that I thought would be good to try, so there’s variety on the table. Initially, did you have to get over the awkward feeling of people staring at you while you were photographing your food? I don’t think I’m as exaggerated [as some food bloggers]. I definitely get up from my chair, but I don’t really stand in my chair to get, like, a flashlight photo, but I’ll definitely stand up from the table and get pictures. As for people giving me weird looks, I don’t really care. Have you made this your full-time job, and if not, is it something you plan to do eventually? No, it’s definitely not my full-time job. Ideally I would like it to be, because it’s something I really enjoy doing. I feel like there are a lot of factors involved in making it my full-time job. I only use my phone for pictures, so I’d have to invest in a camera and maybe get a website started for blogging, but along with that, trying to maintain the food Instagram … it would take even more time and effort, so I don’t know. It’s a lot to consider. Does the Instagram generate revenue? I actually haven’t really looked at it from the financial standpoint, but it is nice getting a few meals comped. What advice do you have for other local foodies looking to build a following of their own on social media? Just be genuine in your reviews. You have to be current with what food trends or restaurants and bars are coming up and take pictures or [write] content that is engaging and appeals to your readers and viewers.